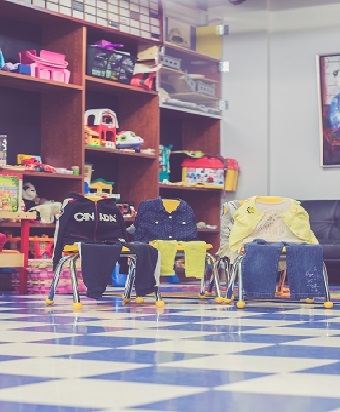 On Sunday, Sept. 30, 2018 we hosted our popular kids’ clothing swap event for the first time at Storybook Buddings and it went very well. Why to shop, when we can swap? 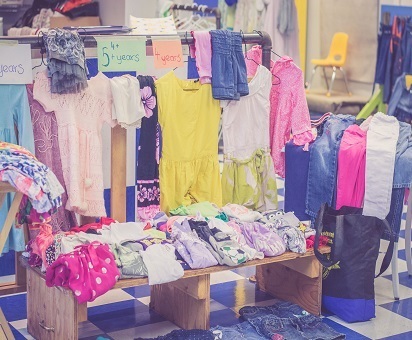 Beside giving well-loved pieces of clothes a new life, swapping is a good opportunity to bring families and our community together. We love helping parents to get some nice clothes for their children for free or symbolic price of $1 and it’s also a gentle way to help our planet too. Cute onesies, shoes, dresses, books, and toys found new homes again….. Some children were surprised to see their teachers and play at Buddings on Sunday, and everyone was very impressed with the displays! We tried delicious vegan, gluten-free Macha cookies that Florence and the Satur-daycare kids cut into the shape of little sweaters and pants, and we had a chance to meet new people too. What a nice Sunday. for bringing all the clothes and smiles to this event, and always being open to our ideas. Falling in love with clothing swaps? Join the next one with us in spring 2019, or check the video below!